It is my mission in life to maintain a constant 'glow'. Whether it's a 'Hi I've been slurping on green smoothies and devouring fish and steamed greens every single day' sort of smug glow; or a 'Check out my delicious, deep golden glow after spending a week or two somewhere sunny in the Mediterranean' glow. Today I'm here for the golden glow. There's nothing more disappointing than a week after a well deserved holiday, your sun kissed skin starts to fade away as if your paradise trip didn't even happen. Here's the thing: it's all about what you do before, during and after. It's a process. You have to prep your skin and keep it in good condition if you want the glow to last. Hydration is key no matter what process in your tan maintenance. Start by ensuring you're obviously drinking plenty of water daily. The more hydrated your skin is, the less likely it'll become dry in the heat of the sun. A tan is essentially all of the dead skin cells from being exposed to the drying sun, or at least it is when your skin isn't hydrated enough, hence why it so often disappears soon after you've landed back at home. Hydrate your skin and get it looking plump and healthy, meaning the tan you do develop is much deeper and richer, plus will last longer. Of course, buffing away any current dead skin cells with a non-drying body scrub and follow up with your favourite hydrating body lotion. I've been loving both of these picks from Sanctuary. Their 4 Day Moisture Oil Scrub is very fine but seriously effective, and what's best is it's infused in moisturising oils . I like to follow up with the Sanctuary Body Lotion (I use this in conjunction with my Clarins Radiance Plus Golden Glow Booster) just to lock in that extra bit of hydration. A new pick is this Elemis Tan Accelerator which I snapped up having read rave reviews that it helped to achieve the most gorgeous tan. Although I'm currently away in Portugal and my full tan has yet to be achieved, I'm yet to report back on the results. Check back next Sunday for my Weekly Loves as I'm hoping this most definitely will be featured. A little goes a long way, which is a relief considering the price tag for a potentially non-essential product. Hydrate hydrate hydrate. You know the drill. You'll want to up your hydration when basking under the sun each day as it really will drunk up all of the moisture in your skin. Keep buffing and moisturising post holiday just to keep your skin cells fresh and to ensure you aren't just picking up tan on your dead skin cells. 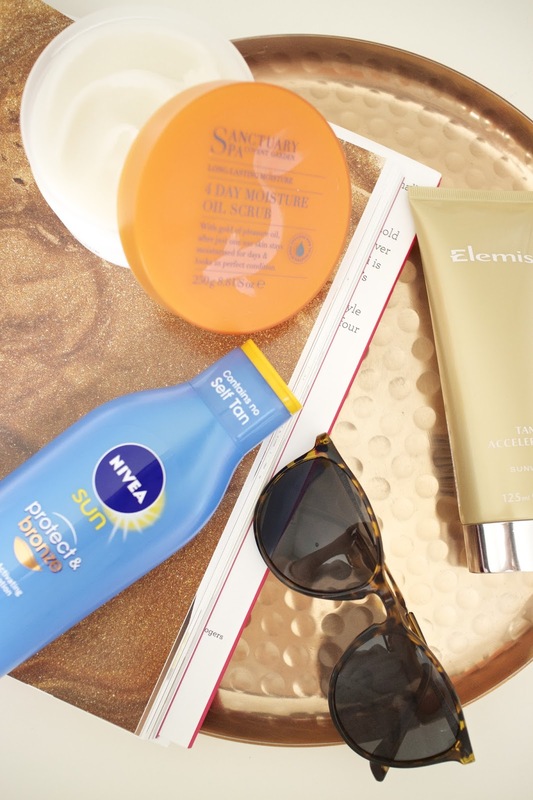 In recent years several brands have launched sun cream infused with a bronzing boost. I tried the Boots Soltan version last year however it honestly did very little, plus there was a report a few months ago that Soltan does little to even protect your skin! Instead this year I've picked the Nivea SPF 30 with Bronze boost. Shaving more often than not shaves away the tan - golden glow all over except for your legs is not the best look! Grit your teeth and bare an all over leg wax prior to your holiday or grit your teeth some more and try depilating. I was in tears a few weeks ago trying to epilate my hairy legs - 15 minutes later and my left calf was still barely done! The trick is don't leave your hair to grow too long (ok, it wasn't that long, but it had been a week or so since I'd last shaved my legs. Poor James). And an ice pack most certainly helps to numb the pain. Ensure to slather on after sun after a day of lounging by the pool or seeing all the sights just to cool your skin and give your skin an extra boost of hydration. Nivea have released this genius combination of their brilliant In Shower Moisturiser with their After Sun. No more waiting around for your after sun to absorb whilst your boyfriend/partner is begging you to hurry up and get ready. This is often the trickiest part of maintaing your golden glow. If you succeeded with depilating or waxing, keep going because shaving will only scrape away your tan. Don't think you can stop drinking so much water - you should know by now how fantastic the benefits of water are in general for your wellbeing. Also, as terrifying as it may sound, keep using a body scrub once or twice each week just to ensure your skin is as smooth as can be. Top up with some more Tan Accelerator if you want to really lock in your summer glow too, and follow up with your body lotion. If you really want to maintain the golden glow look, a sneaky bit of fake tan is never a bad thing. Just keep it a secret by using a subtle gradual tan or something like the Clarins Tanning Oil - seriously subtle just make sure you really work it into your skin to avoid any tell-tale stripes. Are you off on holiday this summer, or have you just returned? What are your favourite products for maintaing a golden glow? Do you have any extra tips? I'd love to hear from you.